Today I'm super excited to have The Brothers Washburn with us today!! I love these fellas! First off though, I want to tell you alittle bit about their AMAZING Young Adult Suspense/Horror Novel - Pitch Green! Trona is a small, smoggy, mostly insignificant town in Colorado. Besides a booming chemical plant, the only thing that characterizes this dismal town is dirt, sagebrush, and an enormous abandoned mansion. The night sky was deep black, cloudless and filled with stars. Though a thin crescent moon was just starting to come up over the Searles Mountains, it gave little light. The lights from the chemical plant burned as brightly as ever, but Trona, California, is such a small town, located so far out in the desert, there is almost no light pollution. This was a perfect night for star gazing, except for one small distraction. Floating hundreds of feet above the town, a small, bright reddish-white light burned fiercely in the sky, swinging gently in the breeze and drifting slowly to the south-east. The time was about 9:30 pm, and if anyone happened to be outside, watching the sky, this would have been a strange sight, especially when the small light was suddenly engulfed in a brilliant, bright-white flash. The flash filled the sky for less than a second, and then was gone—the small light was gone with it. For several seconds, there was nothing, but the deep black of the cloudless sky, when suddenly a roaring rumble blasted across the town, followed immediately by a shock wave that rattled windows and seemed to sock you in the chest as it passed. Was there a storm brewing with lightning and thunder? Anyone stepping out onto the porch, looking for clouds, found a sky that was totally clear and cloudless. There was no storm. In preparation for the launch of our new book, Pitch Green, Berk and Andy, a/k/a The Brothers Washburn, have occasionally been questioned about whether in reality teenagers would really know as much about guns as do our protagonists, Camm & Cal, in Pitch Green. In fact, not only do our protagonists know a lot about guns, they also know a lot about high explosives, enough to detonate a dynamite blast in the sky high above the town of Trona. For those who grew up in a city, or even suburban, environment, this may seem completely incredible, but for many of us who grew up in the desert, or any isolated rural location, it is not surprising that teenagers would be comfortably familiar with the use of firearms and even high explosives. In a sparsely-settled, country setting, guns and dynamite are common tools used on a regular basis in farming, mining, road building and other rural occupations. In fact, it would be strange if Camm and Cal did not know how to use guns and dynamite. Trona, California, is a real mining town, located in a desolate area of the Mojave Desert, not far from Death Valley. Andy and I grew up in that region in the 1960s and ‘70s. We spent many days exploring hundreds of square miles of isolated desert and high-mountain country. In fact, we sometimes went days without seeing any kind of civilization, including a paved road. During those teenage years, we rarely went camping or exploring without bringing our rifles and pistols, with lots of ammo, and we always carried dynamite with plenty of fuse and blasting caps. There is a real science to a good explosion, and we were continually perfecting our technique. A well done dynamite blast makes most of the pyrotechnics that we see on TV or in movies look pretty silly. There is a big difference between a fake explosion and the real thing. 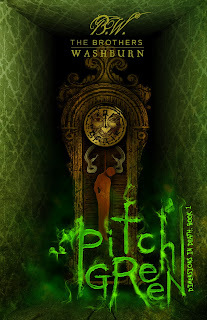 In Pitch Green, Camm and Cal know what Berk and Andy knew as teenagers, so they know their guns and high explosives, which is important knowledge that will come in handy as they fight the intra-dimensional predators, coming through the Searles Mansion, looking for easy prey in this world. Our heroes are not city kids, and they are not afraid to use whatever weapons they might have at hand as they face down monsters, who gladly eat ordinary humans. Don’t be surprised if somewhere, sometime, our heroes set up a dynamite blast in the sky. After all, that’s what we did when we were teenagers. Starting with a stick of dynamite, we made thunder in a clear sky, and we didn’t have any fancy equipment or advanced technology. We did it using only common everyday items that any teenager can readily find in the course of a normal day. If we did it, Camm and Cal can do it too. Like I said, there is a real science to a good explosion, and Camm is especially strong on science, while Cal has a long-term interest in weapons. Together they make a formidable team, doing things that any teenager could do, and, for the benefit of our adult readers, they’ll probably even explain how it’s done. 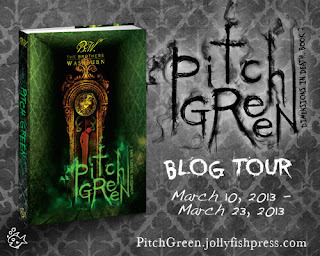 As part of their Pitch Green tour, The Brothers are giving away a $25 Amazon Giftcard!! Use the rafflecopter below to enter! Make sure you leave a comment and tell them thank you!! !